Would you like to build your following through inspiring, educating and empowering your audience, customers and clients? These are some of the many things you learn at an Amplify Your Influence workshop. I struggled for many years trying to figure out how to grow my business on my own and I wanted to save other business owners the pain and headache of the mistakes that I made. I worked for many years with a one-on-one model and I started to realise that it wasn't going to give me the kind of impact that I wanted to create. I invested in learning business, sales, marketing and professional presenter training (with multiple companies) and applied what I learned. It made the world of difference in my business. 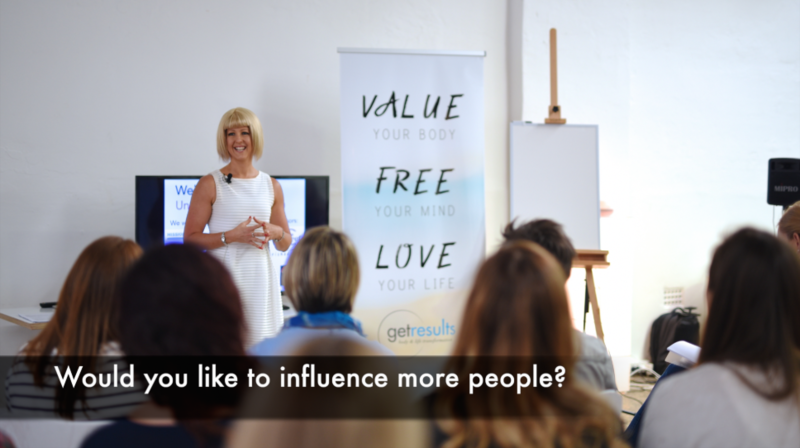 People started asking me to help them achieve results in their business also and as I took on more business coaching clients, it created a great passion for teaching the art and skill of influence to heart-centred, service-based small business owners. I started running workshops and masterminds teach people how to position themselves as an influencer, by teaching them crucial skills I learned from running my own successful business for 15 years. From all the observations, coaching and presentations, I created a rock-solid formula to help people step up, step out and spread their ideas. The formula has been helping people to find and use their authentic voice to help more people, save more time and make more money and make a bigger impact. When you know how to communicate your message powerfully, share your vision and inspire and educate your community effectively, it changes your business. Learning how to influence is one of the most important skills you can develop to grow your business, confidence, and impact. When you build a business based on leveraging your time, your strengths, connecting with your community and inspiring and educating your ideal client, you will remain passionate and enjoy the journey. I'm a strong believer that a profitable business doesn’t have to come at the expense of your lifestyle, and success can be rapid… even for people who’ve never felt like a ‘natural’ entrepreneur and struggle with everything that there is to learn in business. I want to ease the burden for you by showing you an easier way. You don't have to learn everything from the ground-up. Learn from someone who’s walked the path themselves and will give you simple, real and fast solutions. BONUS: Everyone who registers receives a special 'Amplify Your Influence' template pack! Includes access to my most popular downloadable templates, articles and worksheets to help you craft and deliver masterful presentations.